Arriving in Oban on the A85 you will begin to descend a steep hill with the town centre and Oban Bay ahead. If you are approaching from the opposite side of Oban, make your way through the town centre following signs for Glasgow. Once on the Esplanade, turn right at the first mini-roundabout (at the Corran Halls) and go straight on (up the hill) at the second mini-roundabout. Halfway up the hill turn right at the Kings Knoll Hotel and continue for 100 metres until you reach the crossroads. At the junction, go straight across onto Dalriach Road and pass the swimming pool and bowling green on your left. Greencourt overlooks the bowling green. Carry on past the bowling green and turn left at the next junction. Continue for 50 metres and turn left again into Benvoullin Road. On turning the corner, keep to the left and enter the lane (do not carry on up the hill). 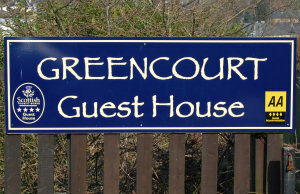 Greencourt is the second house on the left, and parking spaces are marked out on the fence. Walk north along George Street, the main street in Oban, with the Oban Bay on your left. Continue onto the part of George Street past Rogersons Footwear Store, where there are shops on both sides of the street. (ie don't go down onto the Esplanade at the Columba Hotel). 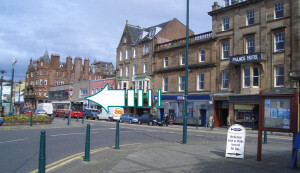 After one block, turn right at Nories chip shop onto Craigard Road and follow Albert Road uphill, keeping to the left. At the next junction, take the middle road which is Dalriach Park Terrace, and continue walking with the terrace of stone-fronted houses on your left. Greencourt is the second house on the left. Follow signs for Glasgow Airport and head westbound past the airport on the M8 towards Greenock. Take the slip road at Junction 30, following signs for the M898 Erskine Bridge. Having crossed the bridge, take the A82 towards Dumbarton and continue for Balloch, still remaining on the A82. Follow the A82 north until Tarbet, with the bonnie banks of Loch Lomond on your right! At Tarbet, turn right (signed for A82 Crianlarich), and at Crianlarich, turn left and head for Tyndrum (a convenient place to take a rest, have something to eat or fill up the car with petrol.) Heading north out of Tyndrum, take the road to the left (signed for A85 Oban). From here, it's a straight run into Oban, passing through Dalmally, Lochawe, Taynuilt and Connel. Alternatively carry straight on at Tarbet, via the town of Inveraray on the A816 and re-join the A85 at Dalmally - slightly longer but arguably an easier drive. Your journey time should be comfortably within 2 hours 30 minutes. Leave Edinburgh, heading for the M9 towards Stirling. Bypass Stirling, still remaining on the M9. Near Stirling, take junction 10 of the M9, following signs for the A84 to Callendar and Crianlarich. Pass through Callendar and Lochearnhead, after which the road number changes to the A85. Continue through Crianlarich and take signs for Tyndrum (a convenient place to take a rest, have something to eat or fill up the car with petrol.) Shortly after the petrol station on your right-hand side, take the road to the left (signed for A85 Oban). Your journey time should be approximately 3 hours. Visit www.streetmap.co.uk or www.multimap.co.uk for a zoomable street plan of Oban. For details of bus or train services to Oban, please visit the web sites of Scottish Citylink or First ScotRail. See our links page for more information. Use the free AA Route Planner service to plan your trip. Enter your starting point, destination and any intervening places through which you wish to travel and get detailed directions and a map.